S P R I N G 2 0 1 6 | The LandReport 29 LANDREPORT.COM October 1, 2015 January 1, 2015 to to January 1, 2016 January 1, 2016 Illinois -1 -4 Indiana -2 -4 Iowa -3 -5 Michigan +1 -2 Wisconsin +2 +2 SEVENTH -1 -3 DISTRICT Percent change in dollar value of "good" farmland N ATIONAL – T REND Two factors put downward pressure on row crops in 2015: record (or near-record) harvests; and the strong dollar, which slowed exports. The national corn harvest was the third largest ever, and soybean output set a new record. 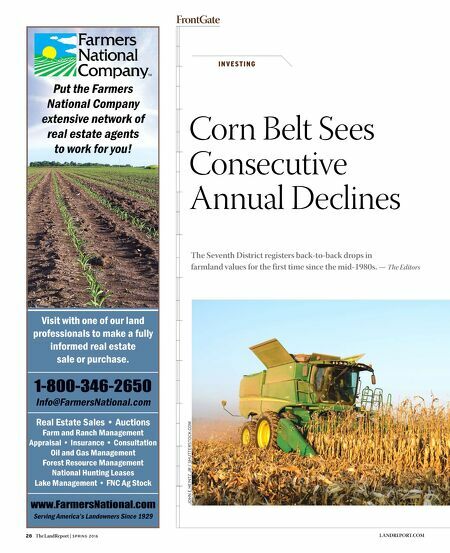 On average, corn prices at the end of 2015 were 4 percent lower than 2014 and 17 percent lower than 2013 nationwide. The drop in bean prices was even more pronounced: 15 percent lower at the end of 2015 versus 2014 and 33 percent lower vis-à-vis 2013. 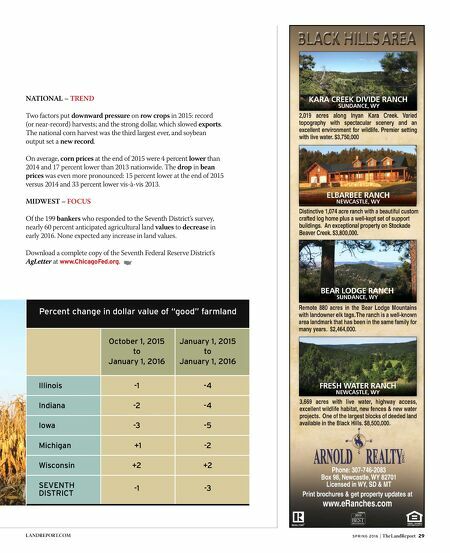 MIDWEST – FOCUS Of the 199 bankers who responded to the Seventh District's survey, nearly 60 percent anticipated agricultural land values to decrease in early 2016. None expected any increase in land values. Download a complete copy of the Seventh Federal Reserve District's AgLetter at www.ChicagoFed.org .